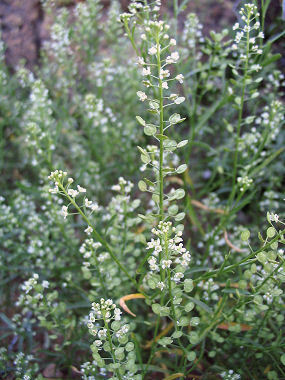 Thurber's Peppergrass is a member of the Mustard Family. The plant grows to 2 feet in height and has light green, narrow leaves that grow to 2.5 inches in length. 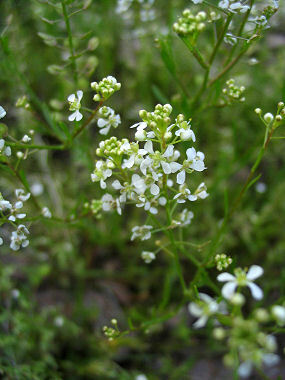 The plant typically grows along roadsides and in fields at elevations below 5000 feet. Thurber's Peppergrass is a common roadside flower. Thurber's Peppergrass blooms between February - November and produces clusters of tiny, white flowers with four petals that grow on the end of a slender stem. Flowers are followed by an elliptical seed pod.